WUZHEN, China, Nov. 7, 2018 /PRNewswire/ -- Today at the Fifth World Internet Conference (WIC), held today in Wuzhen, Zhejiang, under the theme of "Creating a Digital World for Mutual Trust and Collective Governance - Towards a Community with a Shared Future in Cyberspace," Huawei's Ascend 310 chip stood out among more than 400 technology achievements to win the conference's World Leading Scientific and Technological Achievement award. This honor recognizes artificial intelligence (AI) system-on-chips (SoC) as having the industry's strongest compute capabilities for edge computing scenarios, with support from the unified and scalable Da Vinci architecture. This marks the third consecutive year Huawei has received this award and the opportunity to showcase its innovation during the conference. Yan Lida, Director of the Board at Huawei and President of Huawei Enterprise Business Group, presented the achievement to the guests at the conference. Yan Lida said: "Huawei's new Ascend series of AI chips is the core component of Huawei's AI solution and provides the key support. Huawei's AI strategy is to invest in basic research and talent development; build a full-stack, all-scenario AI portfolio; and foster an open global ecosystem. Every year, Huawei invests 10 to 15 percent of our sales revenue in R&D, and this year our R&D investment will exceed CNY100 billion. 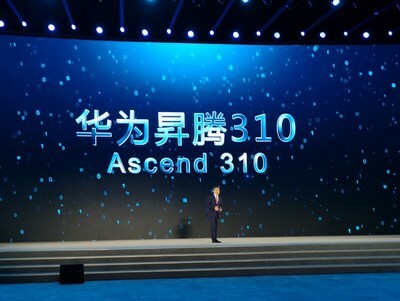 Ascend 310 is the first chip in the Ascend series, which opens a new era of AI. Our advantage is not only to be able to do AI, but also to achieve synergy between AI and cloud, IoT, video, edge computing, big data and other technologies, to form an open "platform" that supports digital transformation for all industries. AI will be the latest technology Huawei makes available to customers and partners on the platform. We will work hard to make sure AI is no longer a technology only open to ones who have high qualification skills. Over the next three years, our aim is to work with one million AI developers to drive innovations in line with Huawei's commitment to provide affordable, effective, and reliable AI, bringing intelligence across every enterprise and industry to build a fully connected, intelligent world." On October 10, 2018, Huawei officially released a full-stack all-scenario AI solution. 'Full-stack' means the solution provides powerful and cost-effective computing power, as well as low-barrier application development platforms that make AI data modeling, model training, and application development simpler, more agile, and more efficient. As an 'all-scenario' solution, it is able to drive pervasive intelligence across various device, edge, and cloud scenarios. Ascend 310 is the industry's most powerful AI SoC chip for edge computing scenarios. Currently, the most typical edge computing scenarios are security and protection, autonomous driving, and smart manufacturing. However, every edge computing scenario imposes severe constraints on space, energy consumption and computing power. Whether it's on a fast-moving car or on a high-speed production line, a complex scientific study or a daily educational activity, Ascend 310 supports every industry with an cost-efficient and powerful computing energy. One Ascend 310 chip can achieve up to 16TOPS on-site calculations, supporting the simultaneous identification of 200 different objects including people, cars, obstacles and traffic signs; it can process thousands of pictures in one second. In October this year, Huawei and Audi demonstrated the chipset in L4 automatic driving. The vehicle was equipped with Huawei's Mobile Data Center (MDC) vehicle-mounted computing unit and it was estimated that Huawei's Ascend 310 chipset consumed only 200 watts of power in L4 automatic driving. The other unique advantage of Ascend series is that it adopts Huawei's innovative unified and extensible Da Vinci architecture, which achieves full coverage â€“ from the ultimate low energy consumption scenario to high computing power scenario â€“ something not yet seen in any other architecture on the market. The Da Vinci architecture is able to facilitate AI application deployment, migration, and collaboration in different scenarios at the same time, which vastly improves software development efficiency, and accelerates AI application in various industries. Huawei advocates 'AI for the benefit of all,' and aims to work with customers, industry partners, and academic institutions to achieve win-win outcomes and enable omnipresent AI. Our vision and mission is to bring digital to every person, home and organization for a fully connected, intelligent world. More information about Huawei's AI strategies and full-stack all-scenario AI solutions is available at https://www.huawei.com/en/press-events/news/2018/10/huawei-hc-2018-eric-xu-ai. The WIC is a global annual event held by Cyberspace Administration of China and Zhejiang Provincial People's government. It aims to create an international forum for connecting China and the rest of the world and a Chinese forum for the global sharing and governance of the Internet. The conference fosters exchanges to enable consensus, cooperation, and win-win outcomes. The fifth WIC is being held in Wuzhen, Zhejiang province on November 7, 2018, and will run for three days.